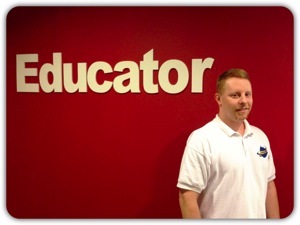 It’s my last day on the west coast following two weeks of recording at the Educator.com studios in Los Angeles. I’ve completed filming of the AP Physics C: Mechanics and the AP Physics C: Electricity and Magnetism courses, and roughly 18 months ago finished recording the AP Physics 1 and AP Physics 2 course sequences. At the conclusion of this massive effort, I thought it fitting to take a few minutes and summarize what I’ve learned from the experience. First, I’m amazed at the total amount of content involved in these projects when all was said and done. The AP Physics 1/2 course includes more than 930 slides, and the AP Physics C total is up over 950. Coupled with diagrams, formulas, and illustrations, these represent roughly a year’s worth of full-time effort, squeezed in to an already busy schedule with early morning work, weekends, and middle-of-the-night can’t sleep sessions. Second, I’ve recognized how challenging the content truly is for the AP-C course. I had some of the content prepared already from my APlusPhysics videos, yet it still took me more than 5 months to create the more-detailed Educator.com lessons. I designed each lesson in detail, and even made notes on what I would discuss, derive, and explain on each individual slide. When I reached the studios in LA, however, I still had tons of preparation work to do. Each day I rehearsed every lesson three times before filming. I’d go over the lessons in detail (including solving all problems and writing out all derivations in my notebook) over an extended dinner each night in the hotel, then go back to my hotel room and do it all again while listening to a baseball game before bed. Early the following morning, I’d get up around 5 am and go through it once more before our 9- or 10-am filming session would begin. Once filming for the day was complete, I’d do it all again in preparation for the next set of lessons. I wonder if I didn’t do more physics homework in my two weeks of filming in LA than my students do in an entire year. I found as I went through this that every time I solved a free response problem or walked through a derivation, I found slightly different methods of solving the problem. Some were smoother than others; some were longer than others. Even though my final passes were usually “cleaner” than my initial solutions, I tried to stick with my initial solutions in the videos to better mirror the approach students might take. Even with all that preparation, the recording sessions were still quite stressful. In walking through the lessons, there were technical components to the presentation that were fairly unforgiving. Hit the wrong button in the wrong order and you’d have to start all over again. Switch colors and then switch slides before writing and you’d have to do it all over again. Cough, sneeze, or forget where you are in a lecture or stump yourself — you got it, do it all again. Thankfully, I’d had quite a bit of experience in this sort of thing from my previous trip out to LA to record the AP-1/2 series, so the amount of “re-do” work was kept to a minimum due to all that preparation. But recording four hours of video lessons sure felt like a 12+ hour day. In addition, I still found the AP-C material challenging. In my classroom, I prepare with 42-minute lessons, and the longest I ever lecture in a row is one entire 42-minute period (and I try to avoid that like the plague). Here, the lessons are straight lecture, with no breaks, no edits, no room for error. That leaves a lot of material to have down cold while also dealing with technical concerns. My detailed noted were invaluable, and I referred to them throughout my lectures to make sure I covered all the salient points in each slide, as well as having calculations pre-solved, as opposed to making viewers wait while I punched numbed into my calculator. With my preparation, my time between lessons was approximately 10 minutes or so to get a quick drink, review the slides for the next lesson for any last-minute issues, and allow the technical folks to prepare the studio for the next round. Others in the studio, however, would take extended time between recording lessons in order to prepare. They had the luxury as they were fairly local to the studios, and could spread their recording work out over months. Working through these courses from start to finish in such a detailed manner in such a compressed time span provides a unique perspective on the course. Each lesson is designed to present a concept as simply as possible, illustrate that concept, and then demonstrate its application in a variety of scenarios. In creating these courses I solved every released AP-C free response problem going back to 1998, as well as a scattering of earlier problems. With the entire breadth of the course fresh in my mind, I’m confident the foundational principles emphasized in the course provide excellent preparation for students taking the AP Physics C exams. One of my goals in creating these courses was to provide a much more streamlined video series than their previous video series. Their previous courses totaled 48 hours for mechanics, and 41 hours for electricity and magnetism. My goal was to cut each of those at least in half, allowing students to minimize their time watching videos, and instead maximize their time actively working with the material. I haven’t seen the final count for the new courses, but I’m confident we’ll be close, if not under, our target. I’m also excited that the College Board will be allowing students the use of formula sheets and calculators throughout the entire exam next year. Even after studying and preparing all day every day for weeks, I still referenced my formula sheets and notes in solving problems and preparing. Memorizing formulas does not constitute learning or understanding, and removing the requirement to have all these formulas memorized will allow students to better focus on what is important. Finally, I knew being gone from my family for two weeks would be difficult. I have a two-year-old and a four-year-old daughter at home, and they are already growing up way too fast. I treasure my time with them, especially our time in the summer when Daddy-Daughter Day Care includes swimming, playing around out back in the sandbox and water table, riding bikes, playground time, and so on. But it’s been even tougher than I expected. I’m so thankful for modern technology which allows me to see them and talk to them each day, but when your little girls says all she wants is you to curl up in bed with her after story time at night, it tugs on your heart strings something fierce. I’m proud of what we’ve put together here at Educator.com through these efforts, and hopeful that students across the world will find these videos helpful in their studies. I’m also excited to know that I will be able to use these resources with my students in the coming years. I’m relieved to have finished this project, eager to refocus my efforts on other projects such as revisions to AP Physics 1 Essentials and completing AP Physics 2 Essentials, but most importantly, I can’t wait to get home and hug my girls.